A major advance in understanding the genetics behind several of the world's most common diseases has been reported. The landmark Wellcome Trust study analysed DNA from the blood of 17,000 people to find genetic differences. They found new genetic variants for depression, Crohn's disease, coronary heart disease, hypertension, rheumatoid arthritis and type 1 and 2 diabetes. It is hoped they will pave the way for research into new treatments and genetic tests. The £9m Wellcome Trust Case Control Consortium (WTCCC) involved 50 leading research groups analysing the DNA from 2,000 patients for each of the seven conditions and 3,000 healthy volunteers. They used "gene chips" to scan hundreds of thousands of DNA markers to identify common genetic differences across the whole genome. Many of the genes identified by the team of 200 scientists were in parts of the genome not previously thought to be associated with disease. In the future it may be possible to test people for combinations of genes to find out their lifetime risk of a disease, which would enable them to modify their lifestyle or undergo screening. One of the most exciting finds was a previously unknown gene common to type 1 diabetes and Crohn's disease, a type of inflammatory bowel disorder, suggesting that they share similar biological pathways. The team also unexpectedly found a process known as autophagy - a process of clearing bacteria from within cells - is important in the development of Crohn's disease. 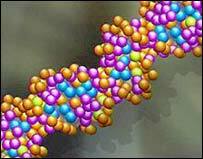 And in type 1 diabetes, they identified several genetic regions that increase the risk of developing the condition. The WTCCC project has already played a part in recent reports of an obesity gene, three new genes linked to type 2 diabetes, and a genetic region on chromosome 9 associated with coronary heart disease. Professor Peter Donnelly, chair of the WTCCC and professor of statistical science at Oxford University, said the research was a "new dawn" and they had learnt more in the past 12 months than they had in 15 years. "If you think of the genome as very long road that you are trying to find your way along in the dark, previously we have only been able to turn lights on in a small number of places, but now we can turn on lights in a large number of places - in this case half a million lights. "Many of the most common diseases are very complex, involving both 'nature' and 'nurture', genes interacting with our environment and lifestyles. "By identifying the genes underlying these conditions, our study should enable scientists to understand better how disease occurs, which people are most at risk and, in time, to produce more effective, more personalised treatments." Dr Mark Walport, director of the Wellcome Trust, added that all the data were being made publicly available to ensure that scientists across the globe had immediate access to the results. "We have taken a big step forward in understanding the genetics underlying some of the most prevalent diseases affecting human health," he added. Matt Hunt, Science Information Manager at Diabetes UK, commented: "The WTCCC has been an excellent example of collaborative working and has produced some exciting results about the genetics of Type 1 and Type 2 diabetes."